Glucosamine is a compound that has been heavily touted recently as the "cure" for osteoarthritis. The fact is, there is no cure for osteoarthritis. However, recent scientific studies have shown that glucosamine sulfate and glucosamine hydrochloride have been able to assist in rebuilding cartilage, slow the progression of osteoarthritis, and ease pain without the side effects of COX-2 inhibitors or NSAIDS. If you are allergic to shellfish you should consult your physician before using glucosamine products. Glucosamine is derived from shellfish. If you are pregnant or lactating you should consult your physician before beginning to take glucosamine. Glucosamine sulfate may increase the risk of developing insulin resistance and could decrease the metabolic actions of insulin. Although glucosamine and chondroitin sulfate are biochemically classed as carbohydrates (sugars), the body is not able to break them down into glucose, so these compounds do not raise blood sugar by providing an additional source of glucose. However, many factors can affect insulin secretion and blood glucose levels in diabetic patients, and we recommend that individuals with diabetes check their blood glucose levels frequently when initiating glucosamine into their regimen. High dosages of glucosamine may cause gastric problems, nausea , diarrhea, indigestion, and heartburn. Glucosamine should be taken with meals to help avoid these problems. Overall, however, there are very few side effects of glucosamine. Glucosamine is very safe in comparison to the side effects of COX-2 inhibitors like Celebrex, Vioxx or NSAIDs. COX-2 Inhibitors and NSAIDS have many side effects. They are associated with stomach ulcers, liver damage, heart attacks, and strokes. While they do provide some pain relief, they do little to fight the actual disease itself. This is where glucosamine and chondroitin come in. Essentially, you have two options when it comes to controlling osteoarthritis. Choice one is to take drugs with severe side effects that will not stop the disease. Choice two is to take a natural supplement that has very few side effects that eases pain quickly and fights the disease of osteoarthritis, often slowing its progression. This decision is easy. The problem is that many glucosamine products are low-quality, in pill form, and are not as effective as they could be. If you have arthritis, we highly recommend trying liquid glucosamine formula Syn-flex�. Syn-flex� is a fast-acting, high-quality osteoarthritis formula for humans and pets. Formulated with pharmaceutical quality liquid glucosamine sulfate, glucosamine hydrochloride, chondroitin sulfate, and nine other arthritis-fighting ingredients, Syn-flex� will not only ease your osteoarthritis pain, it will slow the progression of your osteoarthritis. Learn more about Syn-flex� here. 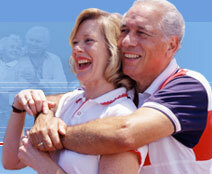 Visit the Arthritis Resource Center for more information on arthritis including studies, research, and breakthroughs.